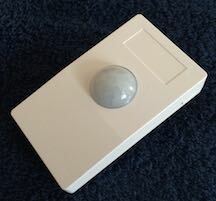 The HomeSeer HSM200 Sensor is a mains powered device which senses motion, temperature, and light. In addition, it has a controllable multi-color LED. Temperature is reported in both Celsius and Fahrenheit. If the temperature sensor values are inaccurate, the sensor can be calibrated. Light intensity is reported on a scale of 0-100, where 0 means there is no light, and 100 means the sensor is saturated. The HomeSeer HSM200 Sensor Device has four output status terminals and three input terminals. The "motion" status terminal shows if it senses motion (on), or not (off). The "light" status terminal senses light intensity (from 0% to 100%). The "temp_F" status terminal shows the temperature in Fahrenheit, and the "temp_C" status terminal shows the temperature in Celsius. The three input terminals control the color of the HSM200 LED. The "red" terminal turns the LED's red color on and off; the "green" terminal turns the LED's green color on and off; the "blue" terminal turns the LED's blue color on and off. Using the 3 inputs, the LED has a total of 8 colors (including the all-off color, black). The following are optional parameters. If you set any one of these values to nil, your HSM200 Sensor will use the last value it was sent (or, if it's a new device, its pre-programmed value). time, in minutes, the motion detect output will stay on, after its last trigger. Higher values will keep the message rate down when there is steady activity. Values must be between 1-127 minutes. time, in minutes, between temperature updates. A value of zero will shut off updates. time, in minutes, between light intensity updates. A value of zero will shut off updates. amount to change the measured temperature when reporting a temperature. The change value can be from -128 to +127. The adjustment value will be divided by 10 and added to the sensed Fahrenheit temperature. These numbers translate to changes from -12.8F to +12.7F. The Celsius temperature will be adjusted so it agrees with the Fahrenheit value.